Capstone Music is THE ULTIMATE place in Burlington for music lessons, because you’ve told us – again! For the 13th time we’ve been awarded and earned diamond in musical instruction for 2019 in all of Burlington. This an honour we are SO proud of achieving, and we’re thankful to the citizens of Burlington for voting for us once again. Without our students, teachers and staff, we wouldn’t be where we are today! There are many pieces within our practice that help us hold this status. From our amazing teachers to our excellent location and everything in between, Capstone strives to make music magic with everyone that walks through our door. 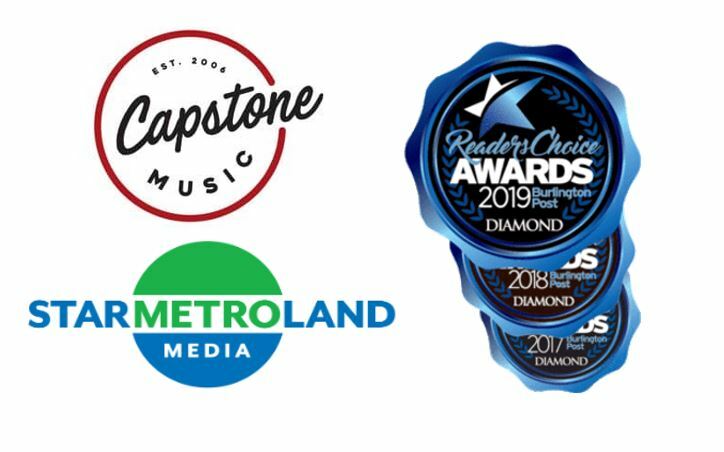 What is the Capstone Music Difference? There is no one thing that allows us to be the difference you’re looking for in musical instruction. Over the years we’ve learned exactly what you are looking for in a music school, and we’ve worked hard to be able to excel in these areas to create a business you can count on. Our teachers are musicians themselves, so they truly understand what they are teaching. Our trained instructors pride themselves on their ability to make learning fun for kids and adults alike. They truly care about their students, and love being able to share their love of music with others. The primary focus of our classes is learning through fun, not through taking tests and feeling pressured to excel. We believe students learn best when their classes are enjoyable and they aren’t feeling pressure to perform perfectly. When teaching music students, particularly children, it is important to go at a pace they are comfortable with, not just one that ‘seems right’. Listening to the student and customizing the lesson plan to suit their needs is something our teachers do very well. Whether students are looking for a relaxed atmosphere or something more formal, our lessons are able to meet their needs. We offer both one on one and group lessons so that we can meet the needs of all prospective students. Regardless whether you are looking for baby and toddler classes, classes to help you start a rock band, or music camps during school breaks, Capstone Music delivers every time. We have lessons to satisfy all kinds of students! Our teachers specialize in a variety of different instruments including piano, drum, guitar and voice lessons. We even have ukulele lessons! From the minute you walk through the door you will be greeted and welcomed into Capstone Music. Our staff are always happy to see you and are quick to help you anytime you need it. Whether you’re waiting for a student or killing some time before a lesson starts, you’ll love the comfortable setting! We have free coffee, games for the kids and a TV to keep you entertained for as long as you are waiting. Dropping the kids off shouldn’t make you nervous, and it won’t at Capstone Music! You can come in with them and wait in our lounge or just drop them off and come back later. Either way, you can rest assured that Capstone Music is a safe and secure environment. Family run businesses know how to welcome clients as an extended part of their family, and that’s exactly what our goal is. We know what it means to focus on family ties, fun and relationships, and we bring those important qualities into our business. We believe taking a family vacation shouldn’t set you back with music lessons and with Capstone Music it doesn’t have to! We fully support families spending quality time together, so we will work with you to schedule lessons around your vacation. Signing up for music lessons shouldn’t make you feel like you are signing your life away. And at Capstone Music, you won’t feel that way! We have no contracts and no required terms. So if your child signs up for lessons and changes their mind, no sweat! We know it can be hard to find parking in the GTA. But at Capstone Music we have free parking right outside the door. It shouldn’t be complicated to take music lessons, so we’ve made it easy. All you have to do is show up! Experience the Capstone Difference for yourself! Don’t just watch from the sidelines, give us a try! Music has so many amazing benefits for people of all ages, but the only way to see those take hold is to sign up for some lessons and try for yourself! You can even stop by either one of our locations to see the Capstone difference in person. Whether you or your family are looking to try out a new instrument, hone some existing skills or expand your music palette and add a new instrument to an already healthy repertoire, Capstone Music would be honoured to welcome you to a class. See for yourself exactly what sets us apart and what’s earned us the 13-time title of Diamond in Musical Instruction by Burlington Post!